I just don’t see the point. They’re so tedious. And then the glorious finished product gets hidden in a shoe, relegated to soaking up your foot sweat all day. 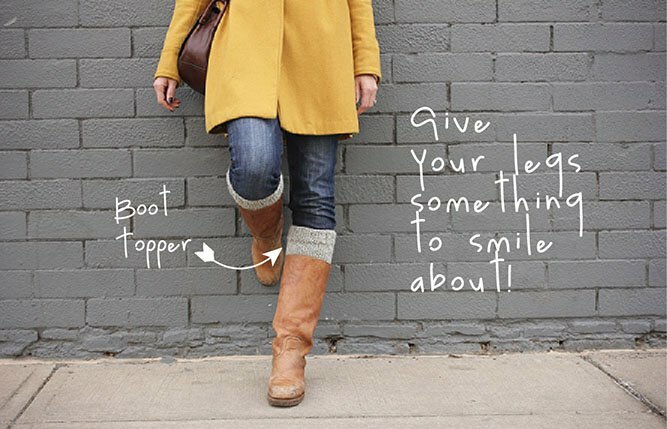 Enter the perfect solution: the boot topper. The great thing about a boot topper is that it gives the illusion of the I-snowshoed-to-work-today vibe without all the bulk of an actual Eskimo sock. I whipped up several pairs of these as Christmas gifts this year and found I could crank one out for every two episodes of Breaking Bad I watched. Not such a bad pace for an awesome DIY gift. It’s super easy (and surprisingly cozy) to make your own little calf Snuggies. I used worsted weight wool and size 7 double pointed needles for these boot toppers, but really, you can use any yarn you want as long as you adjust the needle size accordingly. I find it pretty fun to knit the basic tube and then add some variety in the stitches at the top (the part that sticks out of the boot). 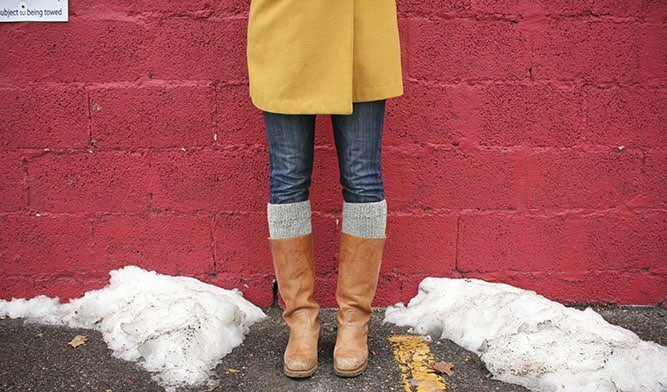 These boot toppers aren’t super tapered because we tend to be a family of pretty thin chicken calves. But if your calves are on the larger side, just add a few extra stitches once you’ve completed the bottom ribbing. 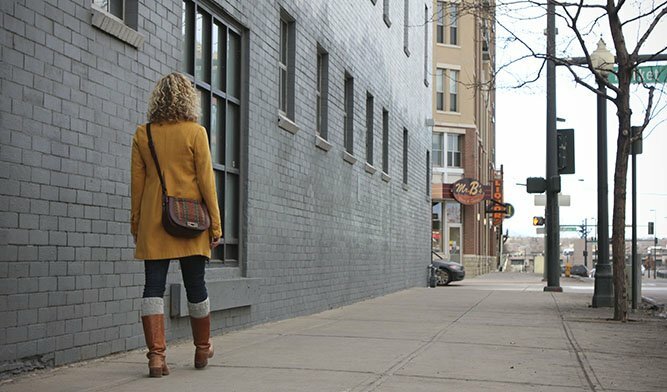 Bind off all stitches, weave in the ends, pull on some comfy leggins and hit the road–or a mural of a road. I love these boot toppers because they’re a super easy accessory that can look completely different based on the yarn and stitches you choose. 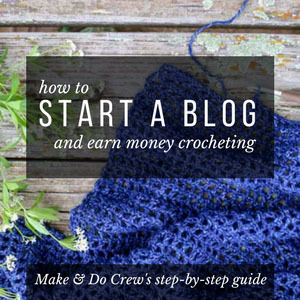 Try a seed stitch. Or ribbing throughout. Or straight up garter stitch goodness. You really can’t go wrong. Thanks to my ever-stylish sister, Mich, for modeling. You’re really a natural calf model. LOVE my boot toppers! Thanks for the pattern, maybe I’ll make some myself. 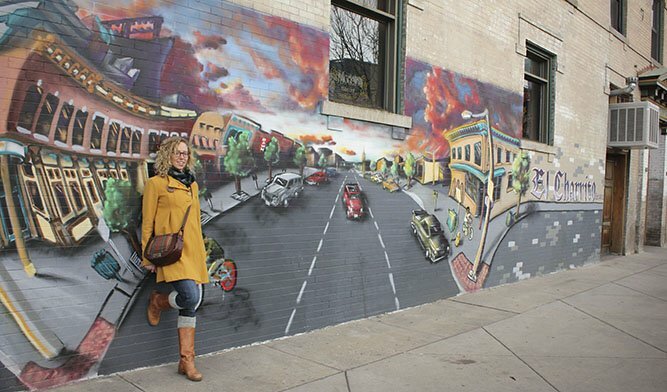 PS – told you that weird mural would be cool. Totally worth the wierd looks from the homeless dudes. Yay! Send me a pic when you do! I have 1 seed stitch boot topper here. I need some yarn to finish boot topper #2! Ahhhh, this is such a cute tutorial. I love the whole photo shoot that goes with it, especially the sidewalk chalk idea. Yay! What a great tutorial. I love that look but it always feel so bulky, will have to try this soon! I totally agree. These will leave your ankles feeling fancy free. How many balls would you need for this project? I’m with you . . . love the look, hate the bulk. But I don’t know how to knit!!! Can you suggest a book or site so I can learn and make these??? Thanks! I’m a very novice knitter and am trying my hand at knitting in the round. Did/do you use 3 or 4 needles? I just tried with 4 and ended up with a huge jumbled mess. Vanessa, the stitches should be dispersed across 3 needles. You will always have one needle free that you’re knitting with. E.g., if you have 12 stitches on each of the three, or needles A, B, C, then needle D will be the one you knit with and will take the place of needle A when you’re done with the row. Then needle A will become the one you knit with and replace needle B when the row is complete. Check out YouTube vids if you’re still confused! Love this pattern! I just finished making a pair of these for my daughter. Will be sending them to her in the mail – she’s going to love them, I know! I’ll email you a picture of them. I used Lion Brand Amazing yarn. This is my first time knitting with DPNs. In the tutorials I have watched, you have to divide the stitches evenly across the needles. Does this mean that you were working with 5 needles if you started with 44 stitches? I only bought 4, so I’m trying to re-work this pattern in my head! My daughter just called me and wants me to make some for her. I’m more a crocheter. Knitting scares me but I’m going to give it a try. I’ve made some crocheted boot toppers and it worked great, but I’d definitely say you should give knitting a shot. Maybe I’ll make a crocheted boot toppers tutorial soon! Good luck, you’re daughter’s a lucky girl! 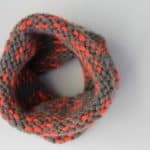 If knitting in the round on four kneedles scares beginners, try just knitting back and forth on two needles, and sewing up a seam as tidily and smoothly as you can. Remember to change to P2 K2 for ribbing when knitting back on the even rows to make ribbing. Then knit a row, purl a row, to desired length, before finishing with final ribbing rows. Thanks for the helpful tip, Fran. You’re totally right–skipping the double pointed needles is just dandy. Thanks for pointing out this work around. thanks for the idea & the pattern. I made 4 pair for Christmas gifts and then made myself a pair with the leftover wool. I knitted 1/2 way then changed the wool to another color to finish them off to length. so I can wear them as if they were 2 pair because the bottom half (in one color) is tucked into the boot while the top is exposed. Reversible! I LOVE THIS IDEA! It’s brilliant! I was thinking of making a new pair of boot toppers soon and I’m definitely going to take your suggestion. Thanks! 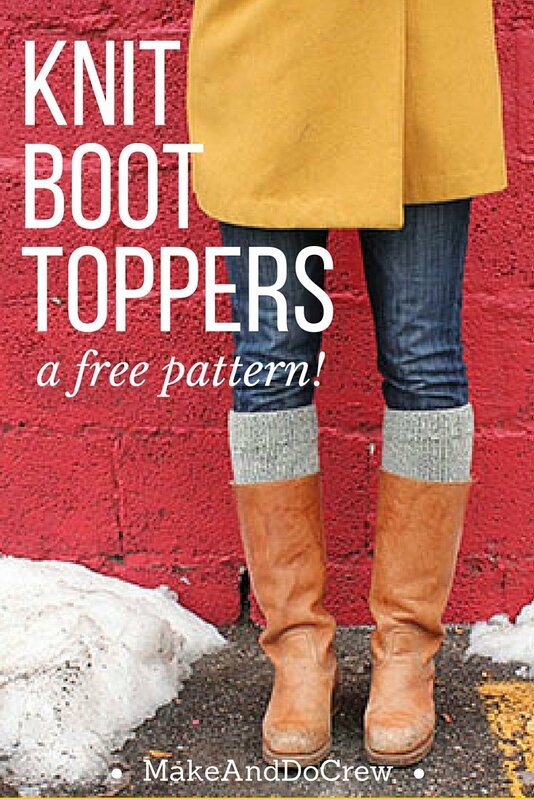 I’m going to make these boot toppers using 9″ circular needles. It’s a lot easier than double points. Great idea! I’d love to see how they turn out. where can you get 9″ circulars? I have 16″ circulars…wonder if they would work?? Hey Lynne, I think the 16″ers would work, but you would have to slide the stitches around periodically because there wouldn’t be enough to cover the entire needle. Essentially, you’d have a strand of the needle cord sticking out like a loop from your knitting as you rotate the stitches through. Does that make sense? I lOVE the brown boot topper on pattern 5, but can’t figure how you knit the “ripple” stitches on the top. 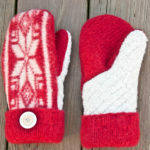 I will be be making these using #7, 9″ circular needles. The ripple is a knit 2, purl two ribbing. Simply knit 2 stitches, then purl the next 2. If you’re not sure now to do a purl stitch, there are a lot of great videos on Youtube. Hope that makes sense. Hi Jess. Thanks for your response, but I’m not sure if we’re talking about the same boot topper. 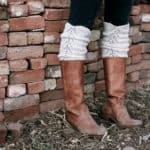 I was wondering how to make the pattern on the brown boot topper (above the photo of the variegated boot topper.) I can’t figure out how you knit those three rows that look like a seeded stitch. I too would like to know the pattern for the boot toppers with the top that is not ribbed. Please let me know when it is available. That boot topper is very adorable. Thanks! Would love it if you would also sell these…already made…on etsy or something. Love the look, but I don’t have time to learn to knit right now. I would have already bought them if they were for sale, though. Thanks for the idea, Tiffany. I afraid I don’t have a lot of extra time to tackle that right now, but I’ll definitely let you know if I decide to start selling some. Boy, that would be a fun, cozy business to launch! I’m afraid I don’t have my notes on that pattern any more, but perhaps I’ll re-write up a similar pattern soon. Thanks for reading. I know this is an older post, but I just found it today and I’m so happy I did! Can’t wait to make a few of these before the cold really sets in 🙂 Thank you! I totally agree. I just pulled my boot toppers out of storage the other day and I was so happy to see them. Thank you so much Jess for stating your logic for not knitting socks! Like you, I will never knit socks or be made to feel inadequate for not knitting socks! Gold Toe, Hanes and Fruit of the Loom have the science perfected so there is no need for me to suffer the frustration! Boot toppers, however are next on my needles! Ha ha! I’m glad we see socks the same way, Deb. Here’s to boot topper season! Does anyone have a suggested length for the ribbing? I have granddaughters of all ages…do you have a suggestion for making the knitted boot toppers for 8 – 12 year old’s. The 44 stitches for the 15 – 18 yr old’s worked well. Thank you for sharing your pattern. You’re so sweet to make boot toppers for your granddaughters. I’m glad to hear the pattern worked for the 15-18-year-olds. I’d try casting on 36 stitches for the younger girls. Keep in mind, you can always increase or decrease the number of stitches cast on by increments of 4. That way, the ribbing will always line up to alternate knit/purl. Do you have a scarf pattern that will lay flat rather than curl up? What kind of scarf are you hoping to make? 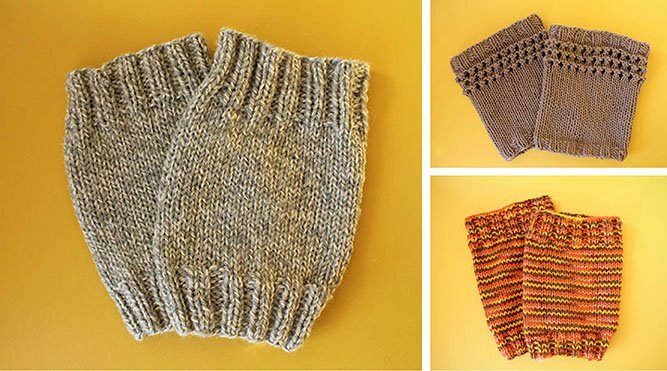 Typically, anything that is knit with ribbing (alternating knitting and purling in the same row) or stockinette (knitting every row), won’t curl much. Where things get curly is when you’re knitting a row and then purling the next. Do you use Ravelry? That could be a great place to look for scarf patterns. This cotton cowl was super easy and not the least bit curly. I was just asked if I could knit these boot cuffs nd I found your pattern. You mentoned you knit in the round can youuse a circular needle? I just finished making knit cowls and they were done with a circular needle. Pattern looks the same but smaller. Please advise loe the pattern thanks. Loving this, might have to start this project this weekend!